On the Inspiration Board this morning is a picture from St. Thomas. 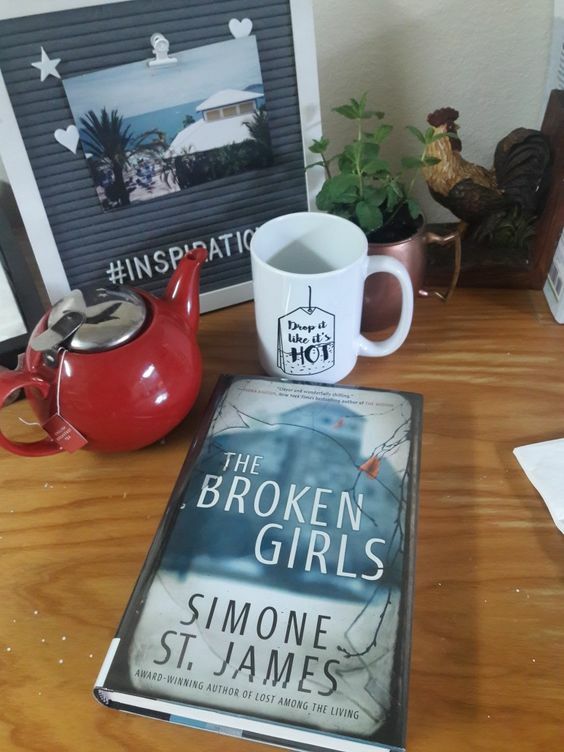 Waiting for my English Breakfast Tea to steep and reading this really great book from Simone St. James. Yesterday was my appointment with Dr. D at the eye institute. We had a heart to heart talk about my progress, why we are moving so slow and where is this all leading? Long story short this June will be no different from the last two. I am having surgery in a couple of weeks. My inbox was full of paperwork this morning as well as a video to watch which I will not do again. No,no. Normally I would have had a lens put back in during my second surgery but it turns out I was missing some rods and stuff to put the lens on. Good news is that I have a lot of good fluid back there, which usually lessens with age. Not mine. Nope. I like to keep as many original parts as possible. So they are going to put me to sleep and go in and surgically sew this new goretex stuff with the lens sewn onto my eyeball. This goretex is what OU Boy’s stints are made of and I will have to carry a card around telling people to back the f*** off my eye! The reason we hadn’t talked much about this one is because it is risky and he needed to know I understood the risks, such as infection and losing the entire eyeball. Plus I’ll need general anesthesia because even with the twilight sleep stuff I fight the restraints on my arms. I have a strong sense of survival. So that’s that. I’ll be in post-op care for 90 days so there goes another summer down the tubes. But the good news again is that after this surgery they can start taking out stitches from the surgery a year ago when I received the transplant. I still have 11. I have 5 new drops to fill and each one is around $300. So my lovely doctor broke them down to the 2 components in the one and those two are way cheaper than the one bottle, so it’ll mean more drops but I can still buy shoes. I am not going to stress about this. I trust my surgeon 100%. He is one of the best in the world. I keep telling myself what a great healer I am. What a great nap I’m going to have. That now I’m a risk taker. Well that one maybe isn’t new. I mean I have no rod thingys because of previous head trauma so obviously I do risky stuff, but this is the right thing, I know. Today I’m going to just drink tea and sit in the sunshine while I still can! Cecily’s Tea Leaves Told Her She’d Just Had Tea. What The Heck is Orange Pekoe? Thank you so much. The past two years have taught me nothing is really in my control. Now I just go along for the ride. That’s really our only choice. I hope everything turns out well with the shoulder!! Dr.D is just about as cheap as me! We have our priorities straight! I’m so sorry! You are so brave. Thinking of you. I’m not that brave, I just pretend until it’s over! Thank you Alexis! You are a lifesaver! Thinking of you, and sending hugs and prayers. Wishing you the best and sending hugs. Good luck and warm hugs. Take care. Fingers are crossed that it won’t be as bad as you think it will be. Golly, gee! This is just another hitch in the git-along. Darn it all. I understand your concern. As a person with only one functioning, sort of, eye you are very careful what happens to it. I’m sorry the beach is out again though I know you will find something to fill in. I’ll be keeping good thoughts for you. I have an entire pool for myself and I’m living out there now. I can read anywhere so I’m going to soak it all in while I can!